“The Drop” is now playing at Sundance and Eastgate Cinemas. R, 1:46, three stars out of four. I had thought “Enough Said” was the late James Gandolfini’s final role, so it was a welcome if poignant surprise to see his graceful bulk move through one more movie, Michael Roskam’s crime drama “The Drop.” He plays Cousin Marv, a small-time Brooklyn hood who got pushed aside when the much nastier Chechen terrorists moved into the neighborhood. Now, Cousin Marv sits in the bar he used to own, drinking and reading the paper, but Gandolfini puts the glint of what-might-have-been frustration in his eyes. Like Gandolfini, Cousin Marv bears watching. Gandolfini is the high point in a very strong cast in the film, an adaptation of the short story “Animal Rescue” by the great Dennis Lehane (“Mystic River,” “Gone Baby Gone.”) Lehane wrote the screenplay (and turned “The Drop” into a novel, also out this week), and the film loves its gritty, desperate characters and their attempts (often misguided, sometimes tragic) to reach for something a little bigger than themselves. Front and center in the film is Bob (Tom Hardy), Marv’s actual cousin and the bartender at Cousin Marv’s. With his watchful eyes and careful, waddling gait, Bob is a man who blends into the background, by choice. He lives in his dead parents’ house, which he clearly hasn’t touched since they died. He goes to 8 a.m. mass, but never takes communion. He’s the ghost haunting his own life. But some nights, Bob works at the center of Brooklyn’s criminal underworld. Cousin Marv’s is a “drop bar,” which the Chechens sometimes use as a temporary clearinghouse for all the ill-gotten gains from that night’s work. One night after last call, two masked men burst in with guns and rob the bar of about $5,000. The Chechens want their money back, and expect Bob and Marv to get it for them. While Bob is sweating that, he also finds himself an unlikely dog owner after discovering a battered pit bull puppy in a garbage can on the way home from work. He befriends a neighbor, Nadia (Noomi Rapace) who helps him take care of the dog. But a neighborhood psycho (Matthieu Schoenarts, terrifying) lays claim on both the dog and Nadia, and his reputation on the block as having committed an unsolved murder a decade ago backs up his threats. The plotting is a little thin here, especially as Lehane tries to tie Bob’s two dilemmas together in the climax. But as a character study and a mood piece, “The Drop” hits some satisfying notes. Hardy is terrific — after playing a performance that was all words in “Locke,” he turns around and plays a completely different guy in Bob, a quiet loner who may have more good and bad churning inside him that the people around him realize. Lehane has written some great scenes for all his actors, such as a bleakly comic moment when Bob and Marv have to dispose of a severed limb that has come to his possession, and Bob seems disturbingly competent at doing so. 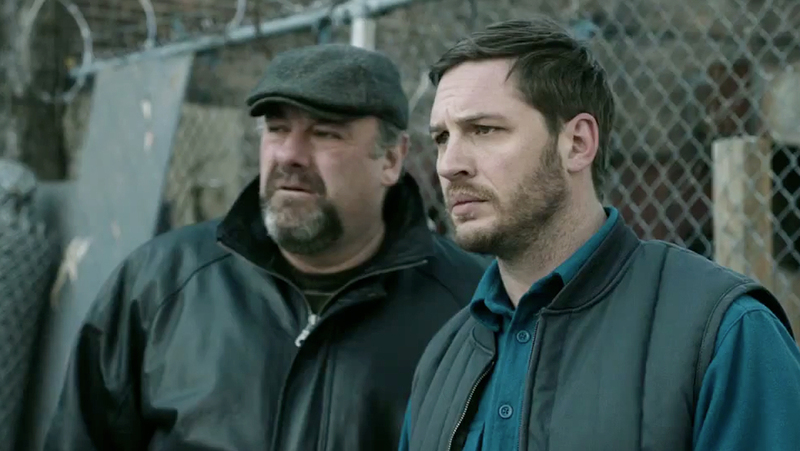 It’s those moments, and the way great actors like Gandolfini and Hardy seize them with both hands, that make “The Drop” much more than your average crime thriller.